“Why does this always happen?” I’ve said this phrase a lot, and have been tempted to say it a lot more. Most recently, I spilled a pile of coffee grounds. 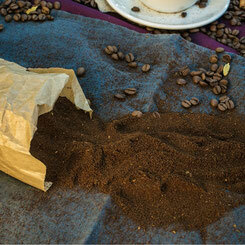 Coffee grounds are like sand - wonderful, delicious, aromatic sand. What I mean is that they get everywhere, and you never truly feel like they’ve been cleaned up. This problem might be eliminated by a single cup coffee brewer, but I prefer my French press even though the fact that I French press my coffee makes me sound like an irredeemable snob. I cancel this out by wearing baseball hats everywhere I go. The baseball hats also cover up the fact that I’m bald. But then I thought about it. I had mishandled the coffee grounds, that’s it. The universe was not passing judgement on my quality as a person. And no, things do not “happen” to me. So much of our perception of luck is really just that - perception. And attitude. When you’re stuck in a traffic jam, it’s not because the other drivers are trying to make you late - they’re stuck too, and some of them think you are conspiring to make them late. My daughter is feeling much better, the coffee grounds got picked up, and that project I thought I had lost ended up back with me. I’m still bald though.